The Railway Stand is now a two-tier, 8,000 all seater stand, and has pushed the overall capacity up to an impressive 30,000. Away fans are also located in this new stand, with the top tier allocated to families, and the bottom tier to the visiting support. The sounds a little odd, but works really well. Dermot Bolger, a Man Utd Fan has e-mailed us, and says 'Finding the ground and parking is relatively simple and there is even free residential parking in certain places near the ground. The accommodation inside is a new stand with modern facilities such as bookmakers etc. And the view is good. The atmosphere is a little disjointed and cold (though the fact that Birmingham were incomparably dull could have played a part in that!). Exit M6 at Junction 6 and take the A38(M) (Aston Expressway). Take the second exit. At the roundabout along Dartmouth Middleway, take the first exit. After about a mile, turn left into St. Andrew's Street. Exit M1 at junction 23A onto the M42. Exit M42 after 29 miles at junction 8 onto the M6. Exit M6 at Junction 6 and take the A38(M) (Aston Expressway). Leave at second exit and then take first exit at roundabout along Dartmouth Middleway. After about one mile, turn left into St. Andrew's Street. Exit M40 at junction 3A on to the M42 northbound. Exit M42 at junction 4 and turn left at the roundabout onto the A34. Continue over four roundabouts, through suburb of Sparkbrook to Camphill Circus roundabout. Take third exit on to A4540 Sandy Lane. At roundabout go straight on to ground. Exit M5 at junction 3A and follow signs for the north on to the M42 northbound. Exit M42 at junction 4 and turn left at the roundabout on to the A34. Continue over four roundabouts, through suburb of Sparkbrook to Camphill Circus roundabout. Take third exit on to A4540 Sandy Lane. At roundabout go straight on to ground. The stations are Birmingham New Street or Birmingham Moor Street (20 minutes walk). A taxi will cost around ?3.50 to the ground. Train times are on 0345 484 950. Numbers 15, 15a and 17 run from Birmingham New Street station along Coventry Road. Numbers 96 and 97 run from Carrs Lane (behind the High Street) to Garrison Lane. 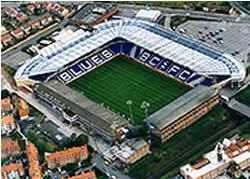 There is street Parking, a small car park at the ground and one on Garrison Lane. For a stadium of this size, the allocation of only six disabled spaces for visiting supporters is somewhat scandalous. These fans are located in Paddock F of the Main Stand, and will be charged £7, with the helper only paying £5 (odd, normally the disabled person goes cheaper!). There is disabled parking available if pre-booked, and it is also recommended that you pre-book your tickets. For the visually impaired, there are seats with a commentary available. Again please book these. The nearest MacDonalds is located in Coventry Road, and was formerly the Watering Hole public house. If you are a registered user then you can login, and create your own personal review of Birmingham City Football Club - St Andrews. These reviews can be private or public.